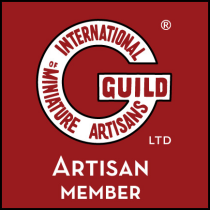 Show Schedule : Miniature Wicker Furniture and Wicker Baskets by Uncle Ciggie's Miniatures, Uncle Ciggie's Miniature Wicker Furniture and Wicker Baskets are meticulously handcrafted in One Inch, Half Inch, and Quarter Inch Scale for miniature collectors and dollhouse miniature enthusiast. PLEASE COME AND VISIT ME AT THE SHOWS. It is pretty hard to keep the website updated with all of the different product and colors, which are all made by me. At the shows, you will see beautiful fabrics on the wicker, along with OOAK pieces, that you may never see again. By Tom Bishop Productions, Inc.